Alfons Mucha set the tone of the whole artistic direction of the late 19th century, the period known as Art Nouveau. Commissions at this time became numerous, with Mucha not limiting himself only to paintings, but also creating pieces for advertising, working on jewellery design and illustrations. The painter was friendly and hospitable in nature, his studio becoming a meeting place for Parisian intellectuals, and a haven for visitors from his homeland. Mucha excelled in hard work and precision. He first photographed his models, before painting them, laying the foundations of modern photography. After a quarter century of living outside his homeland, as well as a great deal of foreign travel, Mucha returned to Bohemia in 1910. He started a family with his wife, 23 years younger than him, and began work on The Slav Epic, something he had anticipated for 10 years prior. The acceptance of the painter, and his works, in his homeland was muted. His first project, the decoration of the reception room of the mayor of Prague, in the Municipal House, was a thorn in many an artist’s side. Being a great patriot, he also participated in the decoration of a section of the St. Vitus Cathedral, for which he created a unique stained glass installation, devoted to Saints Cyril and Methodius. 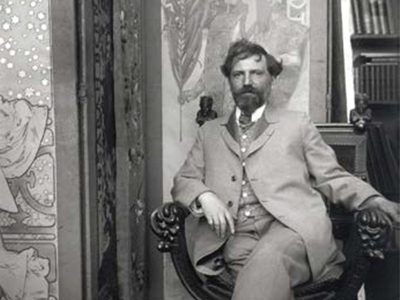 In July 1939, after Nazi Germany invaded Czechoslovakia, Alfons Mucha died of pneumonia following a violent interrogation by the Gestapo. For sometime after his death, Mucha was of little interest to the authorities of his homeland, with his work looked upon as being outdated. However, today Mucha’s work is of great importance and lives on as a testament to the patriots great artistic influence and lifelong achievements.